You have no idea how excited I am to have Ez from Creature of Comfort here today. She is absolutely amazing. I love her blog and I visit it everyday. It’s one of those blogs that shows you pretty things that puts a smile on your face each day. And Ez is a fabulous designer too. All her tutorials are super simple to follow. I love those. Here she is to share with us her gift wrapping idea. It comes with a printable and all. See. Easy. Just what you need this time of year. Hello everyone! It is a delight to be sharing a post here with you today. I wanted to create a project that was equal parts fun and functional and ended up designing some free printable gift tags for you that also serve as decorative gift bows. Hooray for no more bows and tags popping off of gifts (or last minute runs to the store for either)! This is a fun all-in-one solution that is great for everyone. There are two colors to download (to/from and non-text versions of each) and I’ve also included a color-your-own version for those of you who might like to add your own touch to the topper (this is also a great activity to keep kids busy while you’re carefully wrapping the gift boxes). 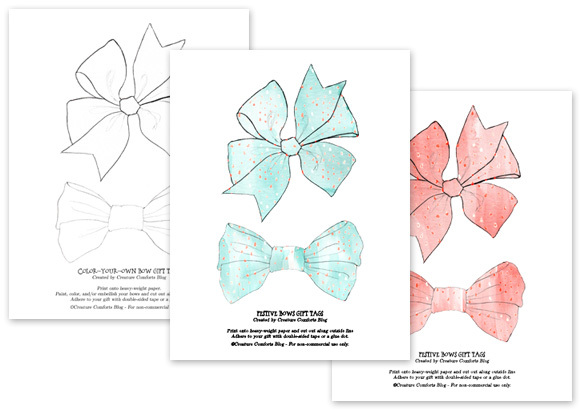 Download your free printable festive bow toppers. Print onto heavy-weight paper and cut out along outside line. 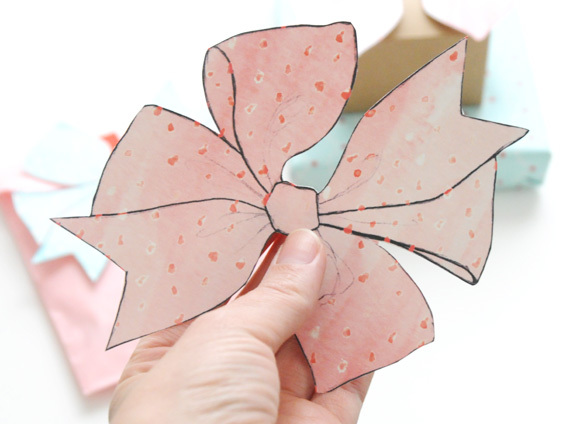 If you’d like to leave a white border around your bows for easier cutting, the results will still look great. 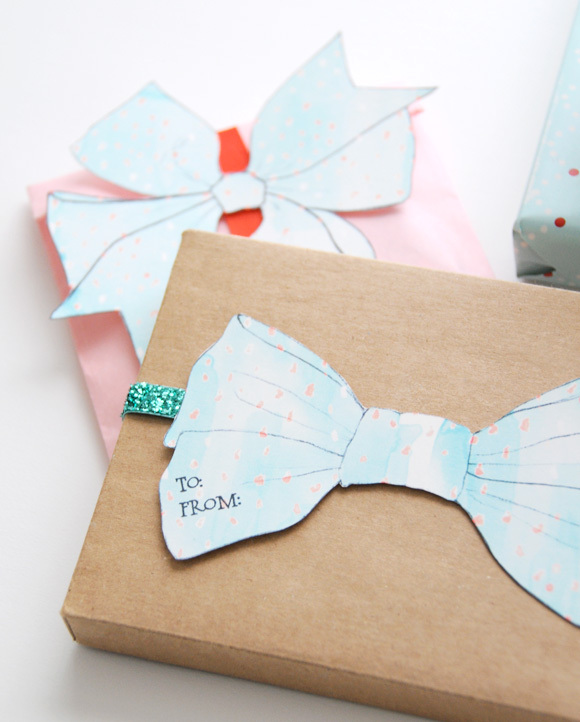 Adhere to your gift with double-sided tape or a glue dot. If you would like a ribbon on your gift, attach the ribbon first (securing with double-sided tape or a glue dot) and then apply your paper bow on top of it. I love this! It’s so simple, but whimsical at the same time. Very cool and so much easier to store than a big box of bows. I also like the idea over at parent hacks to wrap each kids gift in the same wrapping paper so there’s no accidental opening of each other’s gifts amongst all the chaos. Great idea! I agree with Jenny. Great post! Thank you to you both! Thank you for sharing. Perfect, going to a 5 year old’s birthday party tomorrow, so this is perfect. Thanks. Thank you for sharing these they’ll look lovely on the Presents. great idea! i can’t wait to use this on future presents! 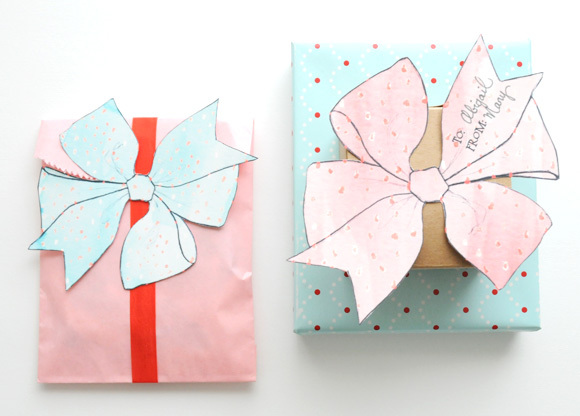 Perfect for those parcels that get mailed – the bow should arrive just as perky as it left! Thanks for the great idea. oh this is so adorable! I’m so behind on blogs. just noticed your wrapping series. I added it to my wrapping post roundup. Thanks for sharing…I´ll feature on my blog..I hope you don´t mind.